In the previous post, we highlighted the default template needed, in case of an Organizational CA, and ended with the creation of the certificates needed for the vCenter Server components. According to our compass KB “Implementing CA signed SSL certificates with vSphere 5.x (2034833)”, the next step is to replace the vCenter Single Sign-On certificate and it points us to KB “Configuring CA signed SSL certificates for vCenter Single Sign-On in vSphere 5.5 (2058519)”. Unfortunately, we are in trouble now, as KB 2034833 refers to the Windows vCenter Server components, with no reference to the vCenter Server Appliance. We will return to this KB later, for the vSphere Update Manager. 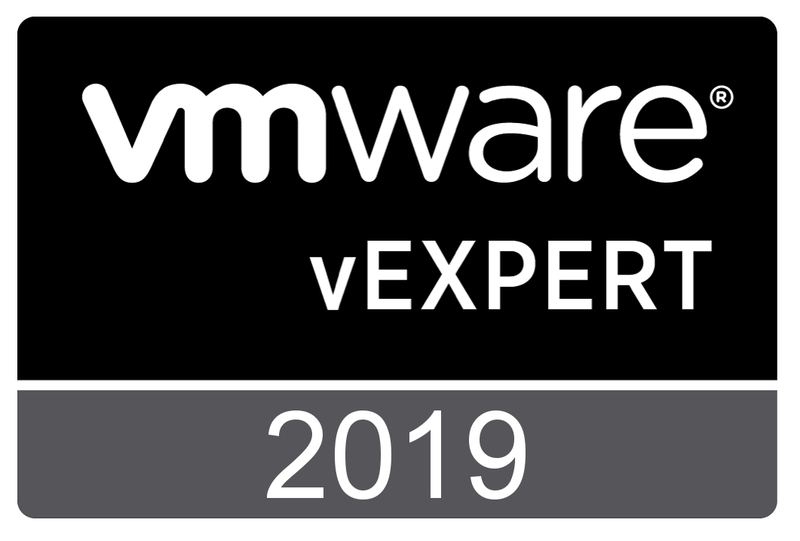 Luckily, KB “Configuring Certificate Authority (CA) signed certificates for vCenter Server Appliance 5.5 (2057223)” is available for the vCenter Server Appliance. In fact this KB contains all steps for setting up OpenSSL, generating certificate requests, getting and implementing certificates. In fact, we have reached the section “Installation and configuration of the certificates for all the components”. This 40 step long section contains a lot of commands. To overcome the differences and make the installation process easier, I have created a script which can be found in this post. Copy and paste the content in a notepad and save as vcsa_certs.sh. This is the second post in a series about implementing CA signed SSL certificates. The previous post provided some background and a few important questions to consider before taking off. Until now, KB “Implementing CA signed SSL certificates with vSphere 5.x (2034833)” is our compass. If you are using certificates from an organizational CA, like I am, the first step is to create a correct SSL certificate template for the Certificate Authority. Follow the directions in KB “Creating a Microsoft Certificate Authority Template for SSL certificate creation in vSphere 5.x (2062108)”. The steps in this KB are straightforward. After creating a new default template, the new template needs to be added to the Root CA or Subordinate CA server. This new template should be used in place of the Web Server template. 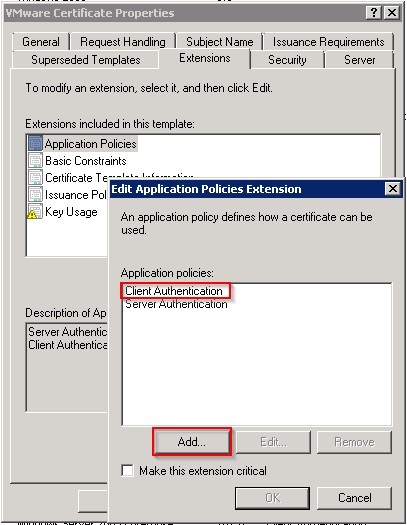 On the Extensions tab, Application Policies, make sure you Add Client Authentication. 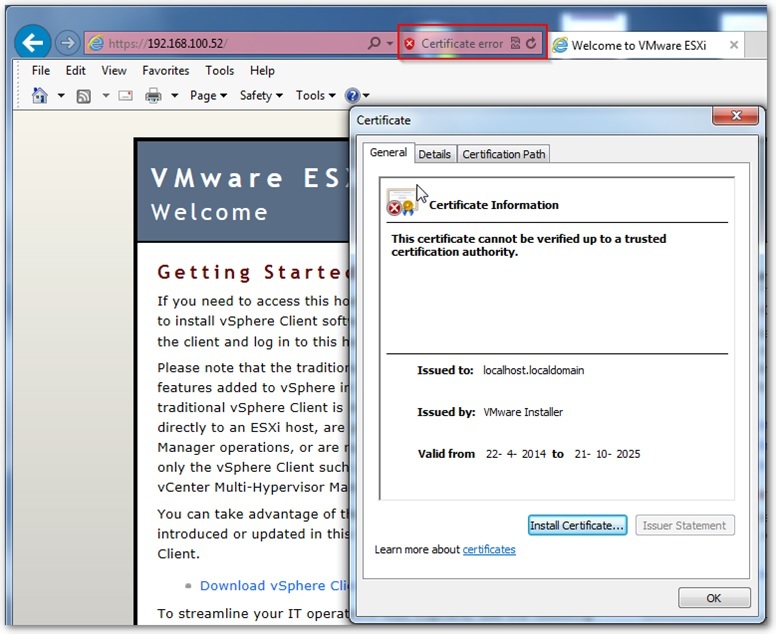 Almost all vSphere components, like ESXi, vCenter Server, vSphere Update Manager make use of SSL certificates. However, the certificates installed during the installation process are signed by VMware and are not verifiable and are not signed by a trusted certificate authority (CA). Using the default self-signed certificates leaves the SSL connection open to Man-in-The-Middle (MiTM) attacks. Replace default self-signed certificates with those from a trusted CA, either commercial or organizational. The vSphere Hardening Guides recommends the following assessment procedure and if you need to replace SSL certificates points to a useful KB. https:// <hostname>/. View the details of the SSL certificate; determine if it is issued by a trusted CA, either commercial or organizational. 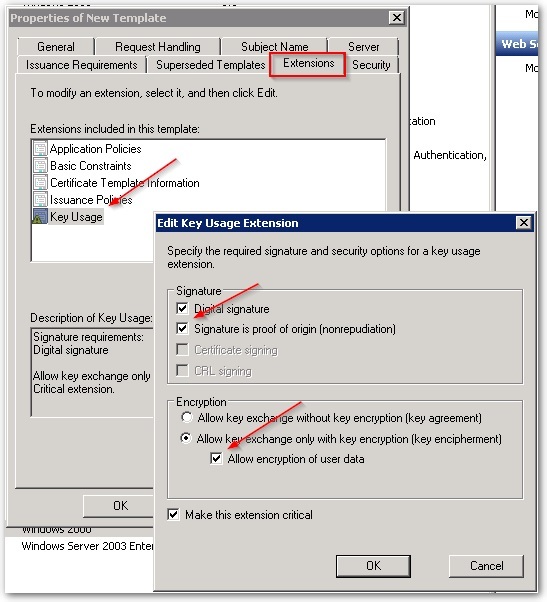 To change SSL certificates refer to KB “Implementing CA signed SSL certificates with vSphere 5.x (2034833)”. See figure 1, for a result. The vSphere Hardening Guide points to the very useful KB 2034833, but it also becomes clear that it’s one of many KB s on implementing SSL certificates, and there are even more KB s not mentioned. So, I was very curious how this would work out in a common vSphere Cluster. You are currently browsing the Adventures in a Virtual World blog archives for March, 2015.